The weather held; we even had blue sky on a wonderful walk to Sandy Creek Falls. About 50 people joined in as we walked in virtual silence along a track that took us north off the Barjarg Rd and down a dry, northerly spur of open forest. It was steep in places, but still fairly easy walking. Occasional boulder-outcrops, plenty of fallen timber and an understory of ferns, low shrubs, lillies and tussock grasses met us as we descended 150 m in altitude, to the valley-bottom. Sandy Creek drains the highest peaks of the Strathbogie Granite Massif, before winding its way down to the northern end of Lake Nillahcootie. 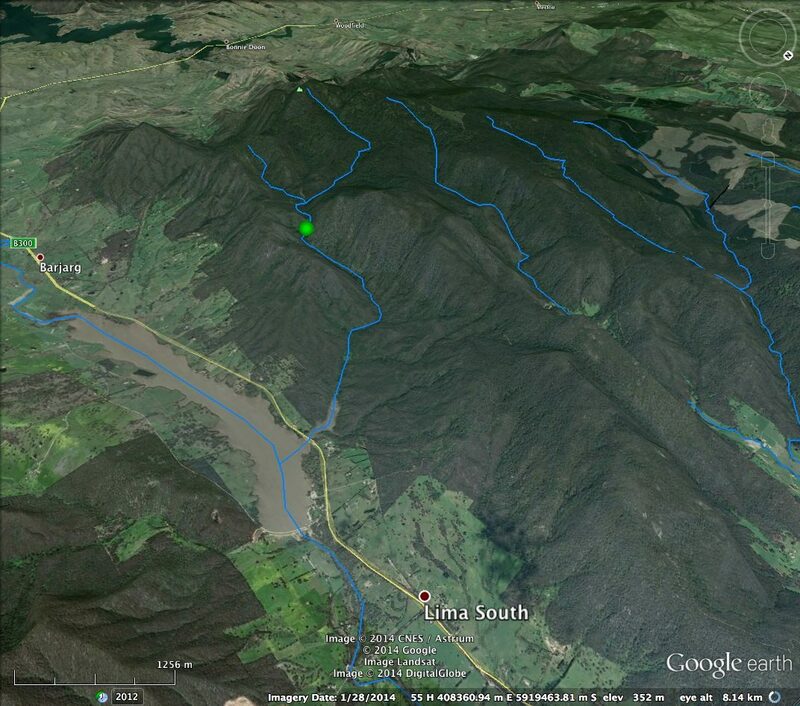 Location of the Sandy Creek Falls near the eastern margin of the Strathbogie Ranges. We gather to acknowledge the Traditional Owners of this land, the Taungurung people, before descending into the valley. Recent rain left some standing water, but the track was fine. Heading down the spur – in complete silence. Huge, moss-covered boulders flank the cascade. A large boulder-heap marked the bottom of the spur and overlooked the confluence of two tributaries of Sandy Creek. A Sandy Creek waterhole; judging by the hoof-prints, a favorite haunt of deer. Sandy Creek and not a blackberry in sight. Rock overhang at the base of the boulder-heap. Crystal clear water flowing over a sandy bed. A solid mat of NecklaceFern (Asplenium flabellifolium) in the shade of a rock. The small Sickle Fern (Pellaea falcata) growing in a bed of moss. The small Saffron Parasol (Cystoderma amianthinum), growing in a moss-bed. It also occurs in Europe and N. America. A flowering Variable Groundsel (Senecio pinnatifolius). Variable Groundsel growing on top of the boulder-heap, with a different ‘fireweed’ behind. 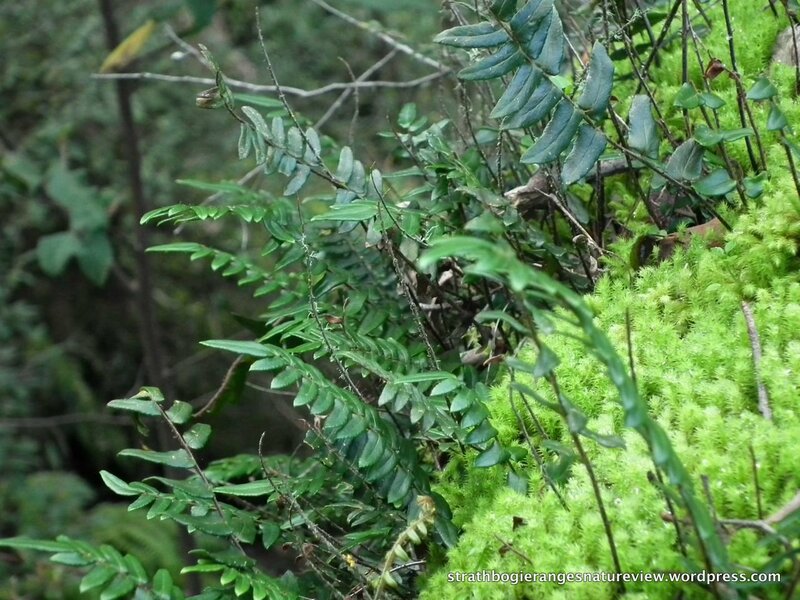 Sickle Fern and Necklace Fern-covered boulder, beneath Musk Daisy-bush (Olearia argophylla). Tree Lomatia (Lomatia fraseri) and Soft Tree-fern (Dicksonia antarctica) in Sandy Creek gully. Happy to improve ID’s if I’ve made mistakes – let me know. Thanks to Sim, for organizing this great walk. It was good to see familiar faces and new. The walk is part of a program of discovery being run by the Strathbogie Sustainable Forests Group, to show people what we still have here in these ranges and what’s at risk if industrial logging, wood-chipping and firewood harvesting get a foot-hold in these forests. Great photos as usual, thanks.